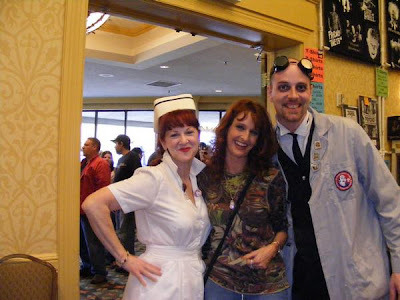 Nurse Moan-eek and I made an appearance at the Lone Wolf Body Art Full Moon Tattoo and Horror convention this past weekend. Had a great time, and met a ton of friendly fans, like the one in this photo, Twiggy. Thanks for sending the photo, Twiggy, and great meeting all the fine folks at the horror show. Was especially nice seeing Ken and Pam Kish and getting a chance to spend a bit more time than usual talking. Looking forward to Wonderfest now!! Frank Dietz draws the Doc! Comics and horror and steroids Oh My!